Expology recently visited Ajax Experience, one of the latest tourist attractions in Amsterdam. Ajax Experience is located in the heart of the Dutch capital, the hometown of one of the world’s most celebrated football clubs: AFC Ajax. The Ajax Experience exhibition has been addressed not only to the older visitors, who remember the club’s glory, but also to younger ones, who will be able to feel the atmosphere of the club and test their own football skills in the different parts of the exhibition. We were interested in the digital floors where parts of the Ajax-philosophy are put on show. An English youth football club visited the centre that day, and they eagerly tested their football control and competed against each other with the results shown on screens. This gives action to the visit. To give other perspectives you can also enjoy the historical Ajax-moments on video or take a master class in tactics. Another great experience is the speech of the coach Frank de Boer to his team encouraging them to win the European Cup Final. The coach digitally walks in to the dressing room and starts talking to the audience. Ajax Experience is an entertaining and pedagogic experience-centre within the field of sports. Expology visited Panasonic Centre in Tokyo in September. A Corporate Global Communications hub for Panasonic that show the latest products and technologies. 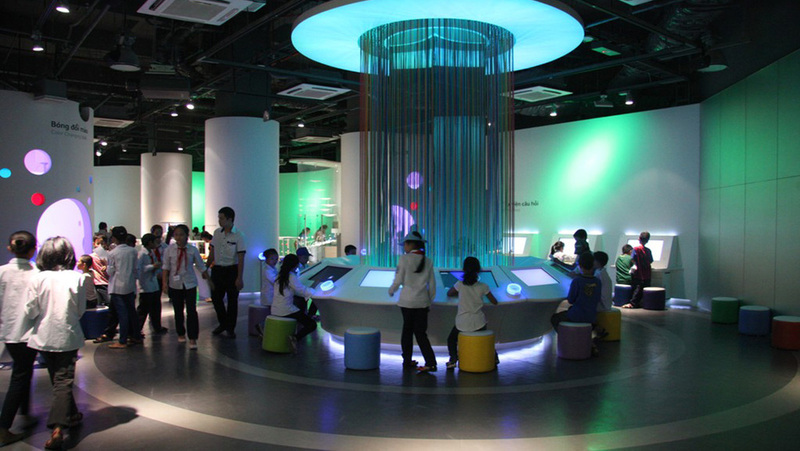 Our focus was RiSuPia on the third floor, a hands-on museum for visitors to experience the fun of math and science. RiSuPia is an engaging experience, with its set up of hands-on activities and interactive games, covering topics such as optics and colour, magnetism, waves and pendulums. It's easy to spend a couple of hours here in an arena presenting actual products and services and in a skillful way visualising Panasonic’s aims to become a "Green Innovation Company". Since the vision is to provide innovation within lifestyle the Center functions as a means of communication for visitors, they can comment and send requests directly to the Center. The dramaturgy of the third floor is based on anticipation and excitement with a feeling of queing up to ride the carousel before being led to a room in a group of 50. At the entrance to the exhibition, you get a headset and a controller, called a Discovery Scope, that interact with the exhibits in the exhibition. The device gives explanations of the background science and its practical applications. It also prolongs the visit as you can look at your result when you get back home with the login you receive when you leave the exhibition. The objects in the exhibition vary and you are faced with quizzes and a mixture of stylistic devices of storytelling with easy explanations of how science works. For example showing how clouds and snow are formed using simple keystrokes. Headset units come in both English and Japanese, and all the exhibits have explanations in both languages. Once you've had your fill of science in RiSuPia you can check out the latest in consumer applications downstairs - environmentally conscious washing machines and other household appliances on the second floor, and audio-visual equipment and videogames, such as Wii and Nintendo, on the first floor. Using film clips, photography, physical models, interactive displays, sporting equipment and timelines - ´Designed to Win`communicates the importance of the design behind sport. The exhibition, curated by Alex Newson at the Design Museum, is a playful insight into the serious world of objects designed to win races, championships and in the case of the Olympics - medals. Walking toward the exhibition, the stairwells are lined with silhouettes of some of the tallest and smallest athletes to have walked the earth, Chinese basketball player Ming Ming grabbing particular attention for his astounding height. Entering into the main room, visitors walk through a hollow bow of unfinished bamboo material. The gallery spaces, lined up alongside the bamboo spine, are painted dark to contrast with fluorescent graphic highlights. Interesting and accessible to all age groups, ´Designed to Win` gives a fun and informative insight into the amount of design and thought behind some of sports most iconic moments. The exhibition runs at the Design Museum until November 18th, we recommend you give it a visit if you are in the London area.